This may not be as “American as apple pie” but it’s close, and a lot less work to put together. I made this last for our community garden’s bake sale, where it was very popular with the kids and the adults. It’s one of the easiest cheesecake recipes I have, especially if you decide to use pre-made graham cracker pie crusts (it will make 2 pies, rather than 1 cake). The only fiddly bits are at the end, when you add the two extra toppings. When you get to the chocolate step, putting something down to catch drips is a good idea. 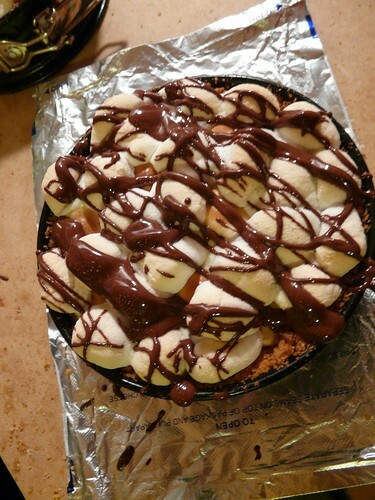 It looks like a much more complicated recipe than it is when you have all that chocolate drizzled on it. Combine cracker crumbs and sugar; stir in the butter. Press onto the bottom and sides of a greased 10 inch springform pan; set aside. Sprinkle with 1 c. topping marshmallows and bake 5 min. more or until marshmallows are puffed. Remove from oven. Stir chocolate chips and shortening together in a microwaveable bowl. Cook on half power 1-2 minutes, stirring twice, or until runny. Dip spoon in melted chocolate and drizzle over the top. Cool on wire rack for 10 min. Carefully run a knife around the edge of the pan to loosen; cool 1 hour longer. Refrigerate overnight. Remove sides of pan. If the slideshow below doesn’t work for you, find the photos on my flickr stream here.